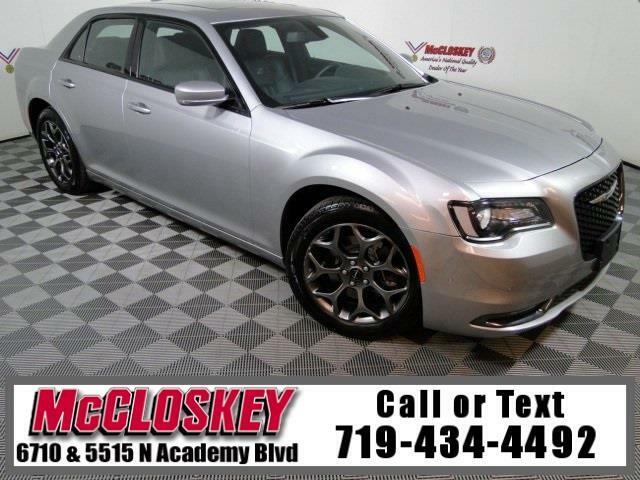 Immaculate 2018 Chrysler 300 S All Wheel Drive with Navigation System, Panoramic Moon Roof, Park Sense, Blind Spot Monitor, Remote Start, Premium Group, and Keyless Entry and Ignition! The sport-oriented 300S comes with 20-inch wheels with performance tires (19s with AWD), a sport-tuned suspension, heated and power-adjustable front seats, leather upholstery, LED foglights, remote start and transmission paddle shifters. Powering this Chrysler 300 is a 3.6L V6 Engine capable of producing 292 horsepower and 260 pound-feet of torque! The reason the 300 is so big on the outside is because it's so spacious on the inside. It gets high scores for ease of entry/exit and overall passenger volume, plus it has a big trunk. This vehicle passed our 110 multi-point inspection and is backed by our National Quality Dealer of the Year Award. We are an ''A+'' Better Business Bureau Rated Business. We offer low interest rate financing, low down payments and the highest trade allowances in the state! Here at McCloskey we do things a bit differently, we shop our competition every day to ensure a great value to you. Come on down and experience it for yourself. This McCloskey Assured vehicle includes a 2 month/2000 mile Warranty and a Vehicle History Report!! At McCloskey we strive to provide ASSURANCE, TRUST, VALUE AND QUALITY! Call 719-434-4492. Message: Thought you might be interested in this 2018 Chrysler 300.